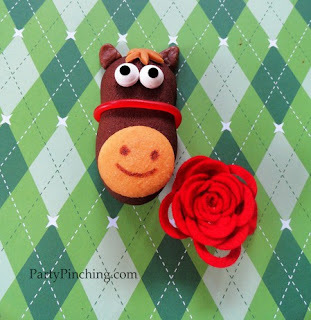 These delightful horse face cookies are easy to make and are absolutely perfect for the Kentucky Derby celebrations and parties. I originally discovered these cookies on PartyPinchers.com who recommended them for the Kentucky Derby. However, I can easily imagine them being served year-round at various parties. I was immediately drawn to these fabulous horse cookies. 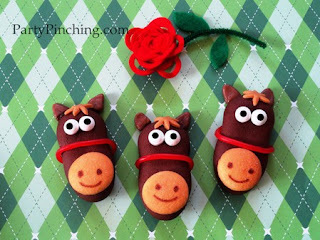 They look so cute and I am sure any Kentucky Derby enthusiasts or horse lover would enjoy this decorative and Fun Food idea. These cookies are assembled with store bought cookies, therefore no baking is required. They are decorated and finished with store bought candies like licorice ropes. The author of PartyPinching.com, Norene Cox, shares her secret to cutting that pretty perfect mane as well as what she uses to assemble everything. I love the smiley face for the horse nose and mouth. An absolutely perfect balance to the constructed eyes and ears. I am quite certain these horse cookies would be a huge hit at children's birthday parties, as well as the aforementioned Kentucky Derby party. They would also make impressive classroom party treats. Except for cutting the mane and attaching the licorice, everything seems simple enough that even a child could help you assemble the horse cookies. Having children help always gives you the opportunity to teach, plus gives them wonderful memories of working in the kitchen with you. You are not just creating fun food, you are creating magical moments that will forever be cherished by you and your child. I am quite certain that adults and children alike will adore these horse cookies. They will probably want to take them home and keep them as pets. It is kinda hard to eat something so cute!